While the Dobro is the king of resonators, not everyone wants their model to look exactly like a Dobro. With the Brown Derby, Fender offer resonator guitarists something a little different, while sticking to the build and materials that offer a great tone for all styles of playing. It may be a bit of a wildcard on our list of the best resonators around, but there are several reasons we’re including it. This is one stylish guitar, and a nice change from some of the more standard resonator designs out there. 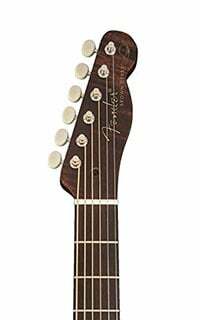 It still follows the resonator recipe quite closely however, with a 25” scale length non-cutaway body and two screened soundholes, but your eye should instantly be drawn to the distinctive Telecaster headstock with the Brown Derby hat logo etched onto it. A real twist on a classic! The body itself is crafted from some striking laminated maple on the top, with sturdy laminated mahogany back and sides, all with cream binding and an open-pore satin finish to give it an extra rustic feel. Moving to the neck, this is made of mahogany and has a familiar C shape, which is incredibly comfortable when compared to many other resonators – electric guitarist will love it. The neck features a rosewood fretboard, with 20 ‘vintage-style’ frets and simple dot inlays. Hard to fault the build quality or the overall style. While traditionalists may not be too keen, the rest of us will find it pretty cool. 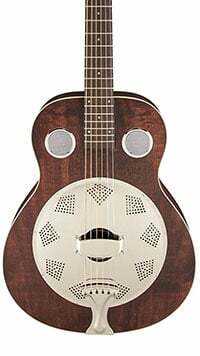 Players who know their resonator styles will probably be able to tell that the Brown Derby features a biscuit bridge, as the coverplate displays a typical diamond dot pattern. The resonator cone itself is good quality, being hand-spun from aluminum in Hungary, Eastern Europe, while a maple ‘biscuit’ bridge sits on top of this. The saddle is made of synthetic bone, while the nut is actual bone. Sitting on the familiar Tele headstock are six vintage-style closed-gear tuners, with attractive aged plastic buttons, adding to the retro effect. Finally, the guitar comes strung with a set of Fender’s Dura-Tone 880L coated strings (a light .012 gauge). All in all, a very decent haul. The two main factors contributing to the excellent sound of this Brown Derby are the woods and resonator. The pairing of mahogany and maple laminates is very popular, as it produces nice warm lows with a good bite. The hand-spun resonator offers a more authentic, vintage-style metallic tone than you may find with a more modern machine-pressed cone, which adds to this instrument’s appeal. As we say, not everyone will adore the Telecaster neck and headstock, but most of us can see the appeal, while the comfort in the hands is undeniable. The sound is full and versatile too, and works nicely for flatpicking as well as it does slide guitar. For under $500, this Brown Derby offers great value. For more info about the Fender Brown Derby Resonator, click here.